It seems almost every day an app or two on your iPhone has been updated. This is of no concern to you because in the App Store settings, you can choose to have apps automatically updated as updates become available. To make things even better, updates are free. Upgrades, on the other hand, may have a fee attached. For example, if you download the free, barebones, or ad-laden version of an app but then want to upgrade to the full or ad-free version, you’ll probably have to pay for it. Here, you learn how to put updates on automatic and how to find and install upgrades. In the Automatic Downloads section, tap the Updates switch to the on position. 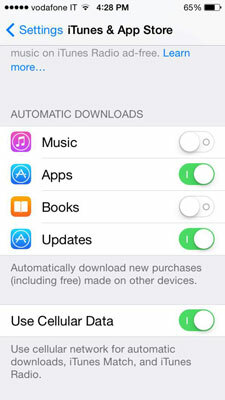 While you’re there, tap the Apps switch on as well so whenever you download an app on one device, it’s automatically downloaded on other devices on which you signed in to the same Apple ID. Tap the Use Cellular Data switch on (scroll down to see it) to download and update apps over the cellular data network. Downloads and updates over the cellular data network are limited to 50MB; any apps larger than that have to be downloaded or updated using Wi-Fi or by syncing with iTunes. Tap the Updates button in the bottom-right corner. A list of apps that have updates appears. The version number is shown under the name of the app. Tap What’s New (it’s written quite small under the version number) to see what changes or fixes the update made or tap the app icon to open the Info screen. A list of changes pops open. Tap the Update button on the Updates list or the Info screen. Tap Update All on the Updates screen. Some apps let you know within the app that a new version is available. You may be playing a game and a notification appears telling you that a new version is available. Simply tap the link that appears to get the new version. Within an app you may be invited to upgrade to the full or ad-free version. There may be a banner across the bottom that says something like “Tap here to play ad-free.” The link usually takes you to the App Store, and there’s usually a fee involved if it’s an upgrade, from either a barebones or ad-laden version to a paid-for full or ad-free version. To keep things simple, in-app purchases are managed by the App Store; however, you make the purchase directly from within the app. Some apps have a Store button in their in-app settings or info screens.